ALL ARTISTS ARE ENTREPRENEURS. ALL ENTREPRENEURS ARE ARTISTS. 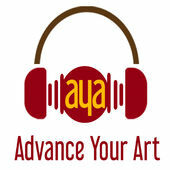 Welcome to Advance Your Art, the podcast that will help you go from artist to creative entrepreneur. A starving artist was not a thing until the mid-19th century when the writer Henri Murger wrote Scènes de la vie de bohème. The idea of struggling for your art is a very romantic one. It evokes the image of someone so dedicated to their craft that they throw away any material comforts. Looking at some of the greatest artists in history it’s easy to believe that this was the life they had chosen. When you look at the lives of Van Gogh, Vermeer, Toulouse-Lautrec, and Modigliani it’s clear that these great artists died pennilessly and their genius wasn’t fully appreciated during their time. It’s an easy leap to believe that these men chose to live penniless lives dedicated to the creation of their art. A correct answer is that they all were terrible with managing their money and chose to squander it with booze, drugs, and women. Today’s economy is rapidly changing. Employees are becoming independent contractors (or unpaid interns). Everyone is in a budget squeeze: downsizing, outsourcing, merging or collapsing. Now we’re all supposed to be our own boss, our own business: our own agent; our own label; our own marketing, production, and accounting departments. This new economy can be confusing but it is better than you think and as an artist, you have more skills than you realize. You are more than just an artist, you’re a creative entrepreneur. An artist who starts to develop their entrepreneurial mindset is one that is self-sufficient and able to survive any change in the market. They can perceive gaps in the market and can work to fill those gaps, they know how to adapt to, work with or overcome the obstacles they will inevitably face. I can help you take your art skills and transferring them to business skills. I’ve been where you are and struggled to try to make any money for years, even after getting an ivy league education. I want to help you learn the tips, tricks, and strategies that took me years to find out so you don’t need to struggle like I did. Based on real world examples I can teach you how to market and sell your work and your brand through story-telling, who your actual target audience is, how to overcoming fear and get work done, how to dress for success, how to approach obstacles as opportunities, and physiological tricks that will give you an advantage in your everyday life. We live in incredible times when the only constant is change, and the rate of change is increasing. Ultimately, the best way to predict the future is to create it yourself. If you’re ready to get started and create your own future take the first step and contact me.